Written on June 7, 2006, and categorized as Secret and Invisible. 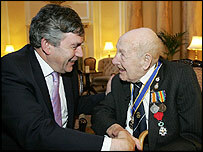 On the left, Britain’s oldest man, 110 year old Henry Allingham, shaking the hand of America’s Most Feared Politician, Gordon “Cheerful” Brown. Henry has put his longevity down to “cigarettes, whisky and wild, wild women”. 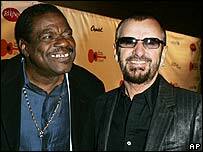 On the right, smiling with Ringo Starr, 59 year old Billy Preston, who sadly died yesterday in Arizona. Billy’s beautiful musicality is one of the reasons I play keyboards.. hearing “Get Back” by the Beatles being one of the most formative moments of my childhood. News in this household is: I woke up and went for a run. Still here, apparently.